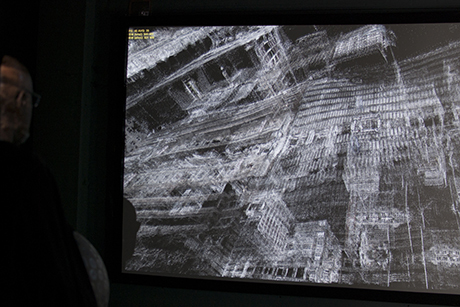 In Ghosted Views the user navigates visually through a detailed X-ray like 3D reconstruction of his surroundings. A reconstruction that blurs the borders between interior and exterior of the exhibition space, the building and the surrounding blocks; the cityscape further on gradually changes into an imaginary constructed space. 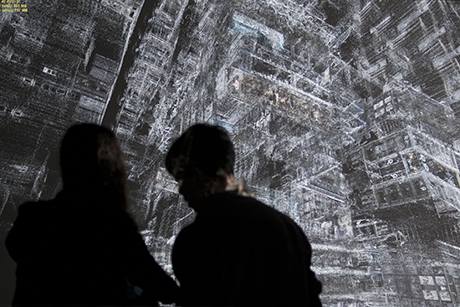 Various scans of the inner and outer spaces are combined into one world without barriers where the users move freely through walls, floors and ceiling in a world that expands in all three axis. The user navigates by holding a round headed pole that’s covered with capacitive sensors. By touching the head right, left, up or down the virtual camera moves correspondingly. Because of shifts in the users balance the object both functions as support on which the user clamps on to while maintaining his balance. The sensor pole, is mounted on a round platform on which the user takes place in front of a 4-6 meter round projection screen; a portal through which the users travels to another world. The imagery is stereoscopic. By subtle manipulation of motion, perspective distortion and slight shifts in balance in the virtual image, this works creates a disruptive physical experience of spacial continuity.